A monstrance is a kind of vessel intended to display the consecrated Host to the Catholic faithful.One important part of the Mass is the Elevation of the Host. The monstrance "elevates" the Host when the priest is unable to do so. Anglican Catholics are familiar with the type of monstrance that is usually displayed on an altar, or is stored in a tabernacle. The monstrance is usually gold or silver-plated. 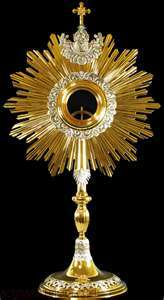 Most often, the monstrance has a sun-like appearance, topped by a cross. The Catechism of 1913 recommended this appearance, because the monstrance represents the light of Christ, the "sun of righteousness."